Honeybees have faced their fair share of environmental threats in recent years, and no threat is greater than the one posed by the parasitic varroa mite. These mites infest honeybee colonies, latching themselves onto the bees and infecting them with a deadly virus. If beekeepers don’t intervene to stop an infestation, it can destroy an entire colony in less than two years. 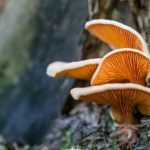 Recently, however, an entomologist at Washington State University teamed up with self-taught mycologist Paul Stamets to explore the ways in which mushrooms might help to protect bee colonies from varroa mites. Stamets first got the idea when he noticed honeybees drinking from the low-growing fungi in his yard. He knew that certain types of fungi can have pharmaceutical benefits in humans, and suspected that they might have similar effects in bees. With this hypothesis in mind, the mushroom expert and his entomologist friend Steve Sheppard began feeding mite-infected bees a steady diet of liquid mushroom extract. Sure enough, the bees that received the mushroom extract had longer lifespans and improved virus resistance compared to bees that weren’t fed with the extract. So far, Stamets and Sheppard have identified five species of fungi that have this beneficial effect on the bees’ immune systems. But the practical applications of mushrooms don’t end there. Paul Stamets is also studying a distinctly different variety of fungus that could kill varroa mites while leaving honeybees unharmed. Soon, the two scientists will begin working with a group of commercial beekeepers to expand their experiments and study their impact on larger beekeeping operations. To learn more about this exciting new avenue of research, check out the video below from the Corporation for Public Broadcasting.